Mehendi, engagement, sangeet and cocktail...the list of wedding functions seems to be ever expanding. And no, we’re not complaining! It just gives everyone yet another day to enjoy, have fun and celebrate. So, if you too are planning to add another night of drinks and dance to your festivities, we’ve got the perfect outfits for you. The cocktail function is when you can ease out a bit, give the heavy lehengas a miss and opt for stylish silhouettes and edgy designs. Here are 15 cocktail outfits for the bride-to-be. 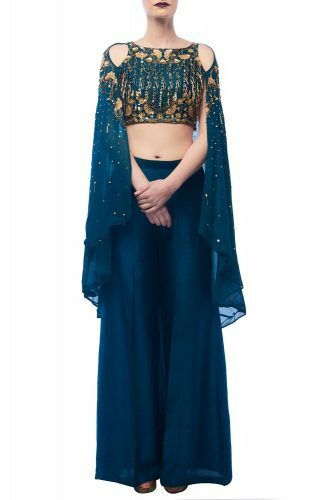 An overall gold sequin blouse, this is just what you need to be wearing if you want that Hollywood glam look for your cocktail ceremony. Side-swept hair with a gorgeous wine lip colour is all you need to make an impact. Price: Rs 22,740. Buy it here. Ladies, this is such a stylish pick for your big night. Flared palazzos and an off-shoulder cape, this one’s sure to fetch you a lot of compliments. We love the subtle gold embroidery too. Pair it with statement tops and a big cocktail ring. Price: Rs 15,500. Buy it here. 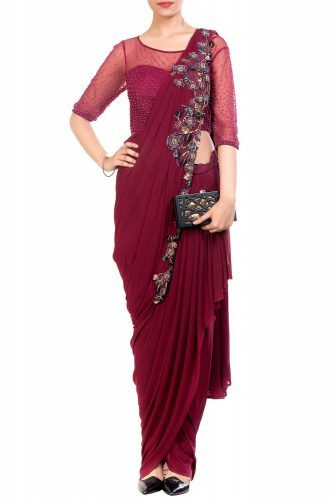 A pretty georgette saree with a mirror work blouse, this is one gorgeous option for your cocktail function. The delicate work and the subtle colour will totally make you look like a dream. Add a pop of colour to your look with a striking lip colour. Price: Rs 18,600. Buy it here. A crop top and skirt set, this is such a cute outfit. 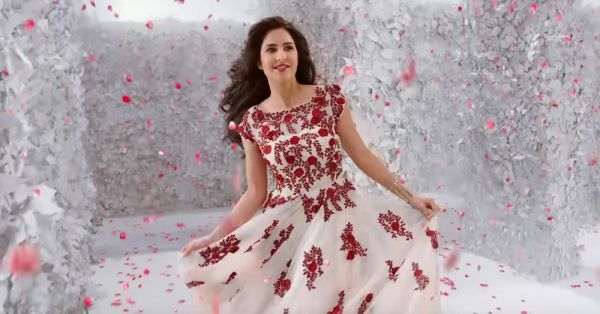 Love the colour, the floral embroidery and the attached dupatta that makes dancing fuss free. Go in for a side messy bun and do carry a smart box clutch with this one. Price: Rs 18,950. Buy it here. An intimate function with just a few near and dear ones? Opt for this comfortable and elegant olive green anarkali suit that is paired with straight pants. A pair of gold earrings and loose curls will complete your cocktail look. Price: Rs 6,800. Buy it here. OMG, we’re loving this colour! It is just so fab. 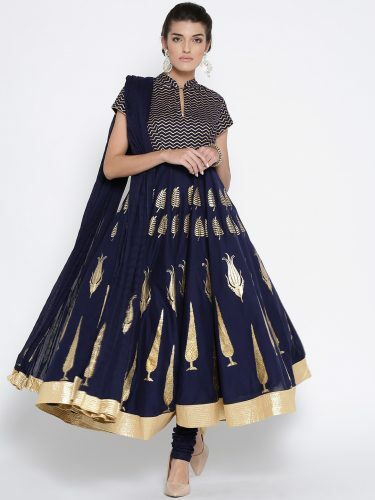 An anarkali suit, this is perfect for that grand cocktail night. It looks royal and elegant and we swear, you’ll be showered with compliments all night long. Price: Rs 9,950. Buy it here. Nothing like a drape saree to flatter your curves. And the wine colour makes the outfit look even more glamorous. Slip on a pair of statement earrings and dull gold heels and get ready for a fun and festive night! 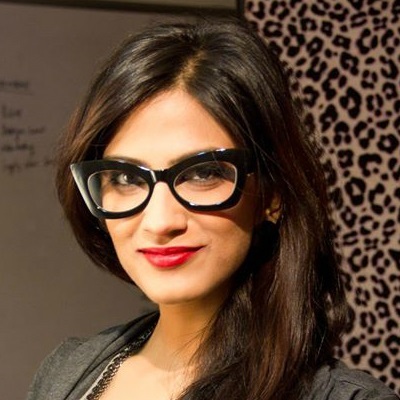 Price: Rs 15,950. Buy it here. What do we say? It’s hard to find something as elegant, classy and sophisticated as this. 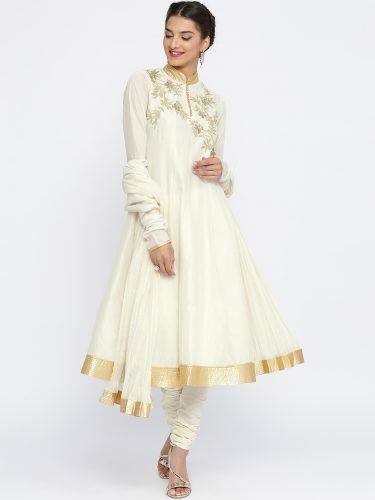 A white anarkali with subtle embroidery and a high collar, this one’s beyond gorgeous. Delicate danglers and a pretty bun will complete your look. Price: Rs 11,950. Buy it here. 10. Charm them in teal! Cold shoulders, cape sleeves and a colour so stunning, this crop top and palazzo set is just so stylish. We also love the beads and pearl work on the bodice. Get ready to dazzle on your special night in this fabulous outfit! Price: Rs 23,900. Buy it here. 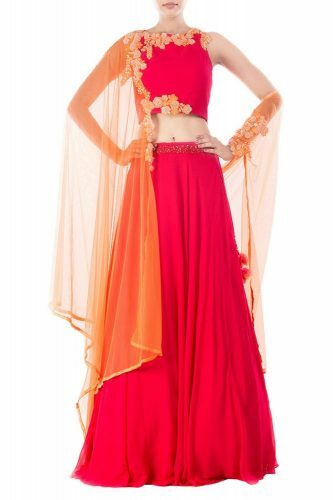 If you want to keep it nice and traditional on your cocktail night, a coral kurta with palazzo and dupatta is such a pretty choice. 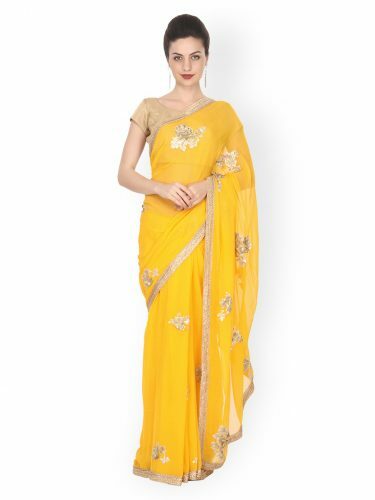 The delicate embroidery looks just so charming and all you need is a pair of chaandbalis to go with this. Price: Rs 6,500. Buy it here. Sometimes, you need to keep it simple, stylish and oh-so-elegant. 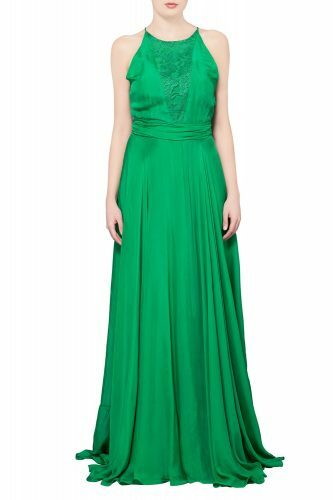 Take a break from Indian wear and flaunt your curves in this gorgeous green gown. A tight bun or loose curls, there’s a lot that’ll pair well with this outfit. Price: Rs 18,000. Buy it here. 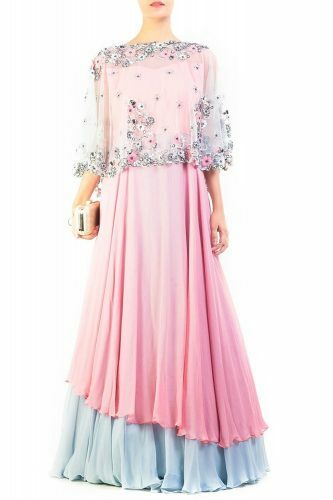 A pastel pink and powder blue gown with a cape, this is yet another outfit we’re crushing on. The colours are absolutely magical and the outfit is a great pick for a sundowner cocktail party. Keep the makeup fresh and minimal and do get yourself a clutch to match with it. Price: Rs 21,500. Buy it here. 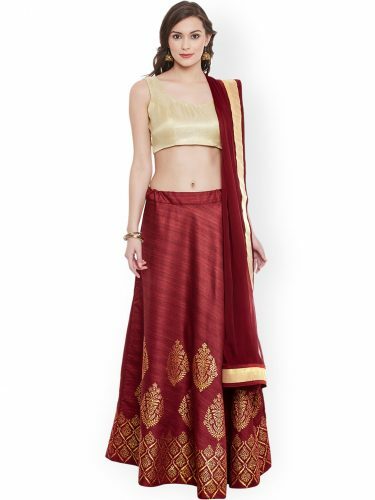 A maroon and gold lehenga choli set, this one’s not over the top heavy and still looks perfect for the bride-to-be. Gold jhumkas, a messy braid and a deep maroon lip colour is all you need to complete your look. Price: Rs 5,199. Buy it here. Give peplums a go at your cocktail function. 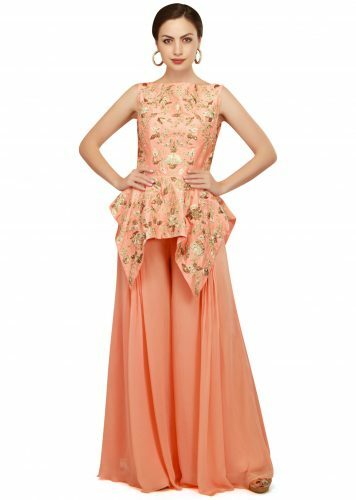 This lovely peach set features a peplum top and flared palazzos. And don’t miss the stunning work on the top. Hoop earrings, high heels and nice big smile...that’s all you need to make this look stand out. Price: Rs 22,140. Buy it here. So brides-to-be, have these outfits got you excited enough for the special day? !